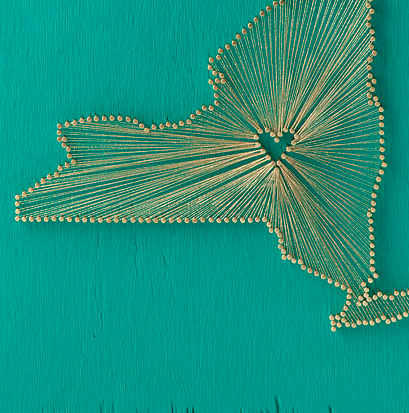 Find of the Week: Heart Strings On Your Wall! This week’s “Find of the Week” hits close to home (wherever home may be, provided it’s in the United States). 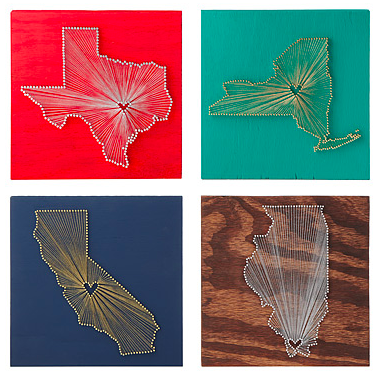 These vibrant little folksy pieces are called “Heart Strings State Love Wall Art” by artist Eleanor Mathis, and they’re available via the online retailer Uncommon Goods. Each 11.5” x 11.5” square is $110, and completely custom down to where the heart is located. They’re made of pretty much what they look to be made of: plywood, reclaimed pine, acrylic paint, nails and sewing thread! They remind me of those grade school math projects you’d have to do where you’d nail nails into a shape drawn on a board, and make patterns with string by twisting it around the nails (anyone?…anyone else do this?…no?). I love every inch of them! See the details for yourself: cute, right? You can specify your choice of red, navy, turquoise, or natural; I think my favorites are navy and turquoise, but you could twist my arm to take any of the colors. Do you love these, too? Categories Art, Find of the Week! ← Color Friday is: Grass Green! Wow its too much beautiful and will be a perfect things on my walls. Its simply awesome. Thanks for a wonderful share.